If you would like to visit a waterfall in the Northern part of Dominica, check out Bwa Nef Falls, about 35 minutes from Ross. The trailhead to Bwa Nef can be found off of the Northern Link Road between Lower Penville and En Bas/Vielle Case. At the time we did this hike, there was a sign marking the trail from the main road, however there was a lot of construction under way so I’m not sure if the sign is still standing. We did find, that as we were trying to locate the trail area, the people of Penville were very helpful in giving us some directions. So when in doubt, ask. To begin the hike, you walk from the main road down toward the river. There you will see the upstream river trail that leads the way to Bwa Nef. During the hike you will be walking around mud, water, rocks, tree roots, foliage etc. so be sure to have appropriate shoes and mosquito repellent. A portion of the trail does cross part of someone’s personal property. You may be asked to pay a fee to the land owner. It takes about 35 minutes to hike to the waterfall. The cascade is almost hidden behind these towering rock walls. The formation reminds me of a small scale Titou Gorge. Beams of light, coming around boulders wedged between the rock walls above you, shine down through the water. It’s just glorious! There is a nice little area to swim in. Enjoy the pics below and check out Bwa Nef if you have the opportunity. 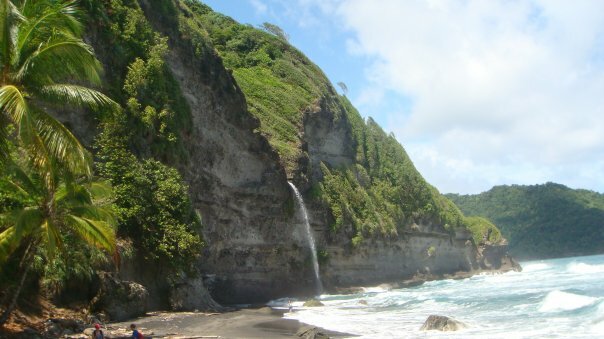 This entry was posted in Dominica Excursions, Island Life, Things to Do in Dominica. Bookmark the permalink.